With over 7,000 5 star ratings compared to under 500 total thumbs down, WeatherPro appears to be an app worth taking with you if you like to travel. It is available for iPad as well as iPhone, Android, Blackberry, Nokia and Windows phones and comes in 9 different languages. 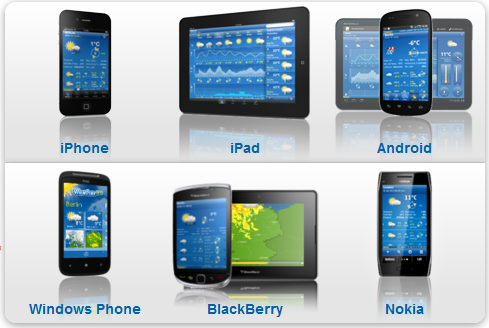 WeatherPro provides comprehensive weather forecasts for over 2 million locations worldwide – as well as 8,000 specific points of interest. The 7 day forecasts include satellite and radar images that can also be animated for extra forecasty fun! Lots of widgets! You can customise the homescreen to fit in with your background, choose from an array of different clock and forecast combos, and the icing on the cake is the WeatherPro live wallpaper. Activate it and you have an instant real time update of the weather, complete with a picture that fits the forecast – without even opening the app! The vast majority think it is amazing, quite a few think it is OK, and there is a small minority that declare it no good at all. Our advice is to visit the website, ensure that you get the settings right (for example storing widgets on the internal memory) and you may well find that the WeatherPro app works wonders for you. You can find out more on the WeatherPro website. This entry was posted in travel apps on September 6, 2012 by worldwideinsure.